Is a proclivity to violence and vengeance a gender and/or regional trait? Are the minds of men more than women and/or rural folk more than city dwellers predisposed to violent acts of revenge? Or put another way, are violence and vengeance intrinsic components of the male psyche, and if so are men more likely to resort to them in rural settings? These are the central questions posed by Israeli novelist Meir Shalev in his seventh novel Two She-Bears (in the original Hebrew Shtayim Dubim, Am Oved, 2013). The novel’s title comes from a story in Second Kings in which the prophet/wonder worker Elisha, after the death of his mentor the prophet Elijah, first demonstrates his supernatural power when village children tease him about his baldness calling him “baldy, baldy.” Elisha gets God to send two she-bears from their nearby cave to the village where they devour 42 children. Shalev’s narrator, Ruta Tavori, also loses a child to an act of God, and the novel’s two protagonists, Ruta’s grandfather Ze’ev and her husband Eitan (who took her surname), both at different times seven decades apart, lose the ability to fully function as adult men and regain their faculties after committing violent acts of vengeance. Perhaps Ze’ev should have been named Arieh, because, like a male lion, before he can take a mate he must remove his rival and his rival’s offspring. Despite his youth, when Ze’ev marries Ruth (Ruta’s namesake and grandmother) he cannot perform his conjugal duty. The couple are secular; had Ruth been religious she might have known that a husband’s failure to sexually gratify his wife is the one ground on which a wife can initiate a divorce. Becoming a murderer does not endear Ze’ev to Ruth, but after a period of chilliness the couple reconcile and consummate their marriage. Ruta and her brother Dovik’s father was born a few years later. Ruta and Dovik’s mother moves to America, their father moves to a city, and the children move back to the moshava and are raised by their grandfather. Half a century later the Tavori family still lives on the moshava, but they have abandoned farming and now own a plant nursery that employs the elderly but physically fit Ze’ev, Dovik, the manager, and Eitan, the affable and socially gregarious salesman. Ruta teaches bible at a local high school, and she and Eitan have a six-year-old son Neta. Eitan decides to take Neta on a father and son hike in the Negev where Neta is bitten by a snake an hour and a half from the nearest hospital where he is pronounced dead upon arrival. Eitan spends the next 12 years in a mute, celibate, post-traumatic stupor sleeping in Neta’s bed at night and under Ze’ev’s command performing manual labor in the nursery during the day moving and piling up heavy paving stones and large sacks of soil and fertilizer. “That is what Grandpa Ze’ev sentenced him to do and that is what Eitan wanted: punishment. Prison with hard labor, with no time off for good behavior and no reduction in sentence or granting himself a pardon. A couple of plot elements are reminiscent of those in the novels of Shalev’s cousin Zeruya Shalev: in Husband and Wife the husband wakes up one morning suffering from what turns out to be a psychosomatic paralysis, which superficially resembles Eitan’s PTSD after Neta’s death, and in The Remains of Love (also reviewed in NYJB) the mother of a central character abandons her to live in America and the child is raised by her stern, disciplinarian father, like Ruta and Dovik were raised by their grandfather. Readers may wonder whether Meir and Zeruya Shalev share a common grandmother who lived in America and a stern pioneer grandfather. The Shalev cousins were both born in the countryside (Meir in a moshav and Zeruya in a kibbutz), but where Meir grew up in his birthplace and moved to Jerusalem as an adult, Zeruya and her parents moved to Jerusalem when she was a child. Meir’s novels tend to have rural and Zeruya’s urban settings. 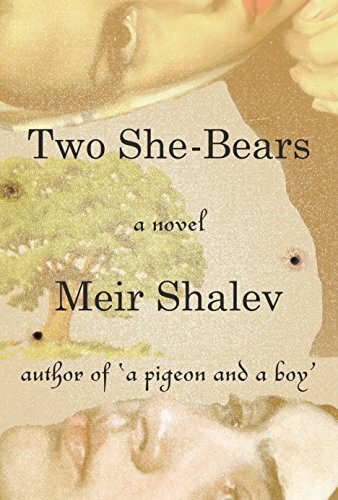 Meir employs traumatic death and vengeance as motifs and plot devices in Two She-Bears as Zeruya employs infidelity and divorce in her novels; his prose is also far less dense and verbose than hers. Earlier this decade Meir moved from Jerusalem to the rural Jezereel Valley where like Grandpa Ze’ev he collects seeds of wild flora as a hobby. So are rural men more prone to violent vengeance than urban women? A novel by another Jerusalem author provides a test case. In Gail Hareven’s Lies, First Person (also reviewed on NYJB) the life long Jerusalemite female first-person narrator plots and with her husband’s help carries out an act of murderous revenge. Perhaps she is the exception that proves the rule. In contrast to Hareven’s apparent endorsement of retribution (confirmed in an interview in Jerusalem Report January 27, 2015) Shalev said in an interview (Ha’aretz June 5, 2013) he disapproves of taking the law in one’s own hands and referred to Grandpa Ze’ev as a psychopath. As a meaty novel of ideas and as a psychological multi-generational saga Two She-Bears is a natural choice for book groups and is strongly recommended to a wide readership.